If you’re looking to perk up your weekdays, because god knows everyone needs a break, look to sushi. Sushi will ease the pain, and sooth your soul. 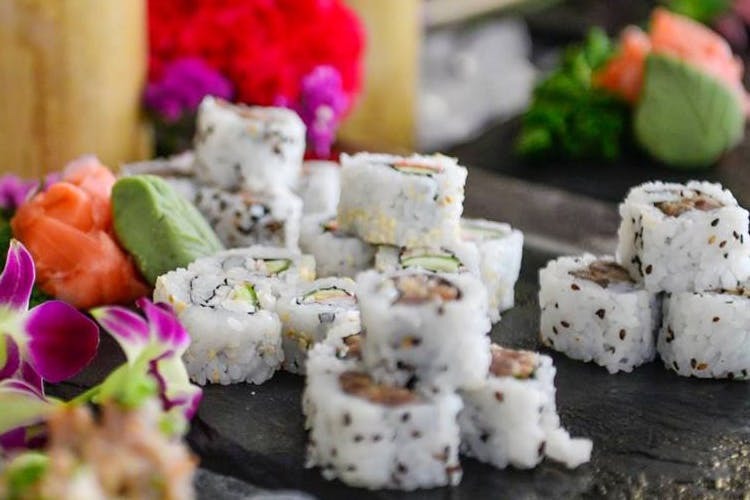 And more importantly, sushi is unlimited — at least at Shiro, in UB City. Offering this deal, Monday to Saturday, from 12.30pm to 3pm, you can eat to your heart’s content and load up on all kinds of yummy sushi or dim sum. Vegetarian can pick the summery fresh avocado and ice berg lettuce sushi, or even the vegetarian spicy California one that has shiitake mushroom, cucumber and avocado packing a punch with a fiery Vietnamese sauce. For the fishy folk, the real deal is the salmon and tuna sushi. They even have Red Snapper and prawn to make you swoon. If you pick the dim sum offer, pick from Mushroom, Cream Cheese and Truffle Oil, Chi Chow style, Vietnamese, Crystal or Shanghai mushroom ones. For the meat eaters, my recommendation is the prawn and chives dumpling, with the Sui Mai and the chicken in hot basil sauce, tied at second.